Just as a community relies on its hospital, Arroyo Grande Community Hospital relies on its community. As a nonprofit organization, the hospital depends on philanthropic support from generous community donors to fulfill its goal of providing compassionate, affordable, and the highest quality health care. Each gift to Arroyo Grande Community Hospital Foundation helps to ensure that these ideals are met. The Foundation is grateful for the overwhelming support it receives from the community and wants to ensure that each donor is properly thanked for their gift. Betty Stephens, the Foundation’s Chief Gratitude Officer, goes the extra mile for those who have contributed to the hospital to let them know how much they are appreciated. At her weekly visits to the Foundation office, she makes personal phone calls and sends hand-written letters to donors. Many donors are previous patients that received extraordinary care while in the hospital, and the Foundation recognizes that giving is part of the healing process. When a patient feels gratitude after receiving extraordinary care, they feel good when they are able to give back in some way, and the happiness they feel is conducive to healing. 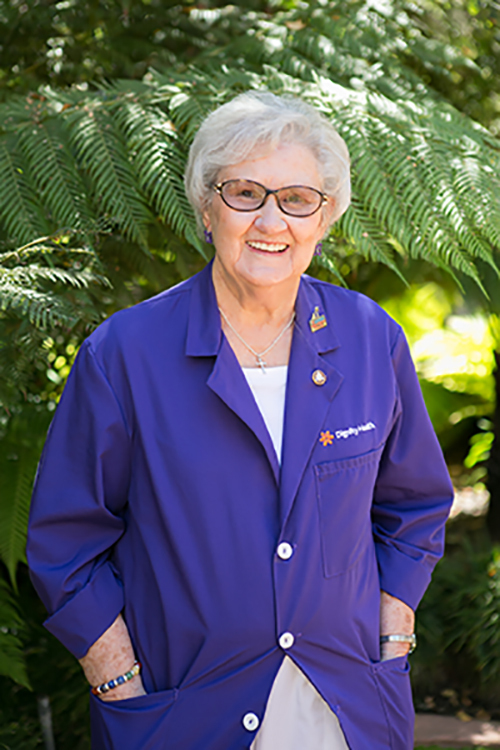 Betty has volunteered at the hospital since 2012, and her incredibly warm, friendly disposition made her the perfect candidate for the volunteer position of Chief Gratitude Officer when it was created in 2015. Over the years, she has delighted in the rewarding conversations she has had with caring community members. The Foundation hopes that all those who support the hospital know how much they are appreciated and how necessary they are to the hospital’s mission of offering the best possible healthcare to the community. That appreciation also extends to its many volunteers who selflessly give their time and efforts to serve patients and visitors. If you are interested in volunteering at Arroyo Grande Community Hospital, please contact Colleen Twomey, Volunteer Coordinator at 805-994-5462.